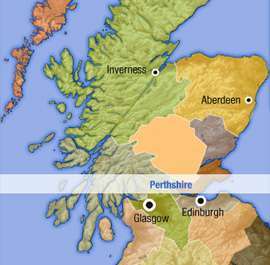 Crieff is the second largest town in Perthshire and is close to many Highland attractions. Crieff's small town centre is popular with golfers, walkers and weekend breaks in Perthshire. With only a handful of hotels available, Crieff Hydro and Crieff Hotel are the pick of the bunch for hotel value. You may also be interested in Knock Castle Hotel & Spa for various spa treatments and spa breaks in Perthshire or The Stakis Cairn Lodge Hotel just over the hill in Auchterarder which is one of the finest country house and hotels in all of Scotland. Make yourself at home. A break at Perthshire's three-star Murraypark Hotel is like staying with close friends. In fact, the team of Lynne, Robin and Iain pride themselves on creating a real home from home. Only an hour from Glasgow and Edinburgh, The Murraypark is the perfect base for exploring the local area. How about setting off on some fantastic walking trails, sampling the local shops, taking a distillery tour or catching up on your fishing skills? Or make the most of your “Passport to Crieff Hydro” which gives you access to the leisure pool and entertainment programme at our sister hotel. If relaxing is more your thing, put your feet up by our open fire, sip a drink in the garden or enjoy a hearty meal in the restaurant. From the South:From the A9 take the A822 signed for Crieff and Braco. Follow this road through to Crieff itself. Follow the sign for the town centre. One reaching the main square turn left uphill after the pedestrian crossing. Connaught Terrace is the third road on the left almost at the top of the hill. The Murraypark is directly ahead.From the North:Join the A85 at Perth. Follow this road for around 15 miles into Crieff. Take the first right hand turn after passing Crieff Golf Club on your right into Connaught Terrance. Murraypark is on the left hand side aprox. 1/4 mile from the turn.